John Pollock previews tonight's enormous WrestleMania 35 card from MetLife Stadium with thoughts on the 16 matches that have been announced. WWE presents WrestleMania 35 tonight from MetLife Stadium in East Rutherford, New Jersey and is expected to be the longest event in company history. With 16 matches official, it is a mammoth-sized show with 85 performers presently booked for matches. On top of that, there will be segments involving Alexa Bliss as the show’s host, Elias performing that guarantees an interruption and whatever other non-wrestling segments are scheduled for the show. John Cena has always been scheduled to have a role on the show and I have not heard of any changes. He is the city and I expect him on the card tonight. Wai Ting and I will have a WrestleMania 35 POST Show on the site later tonight and will be free for everyone. You can leave feedback throughout the show and afterward on the POST Wrestling Forum. 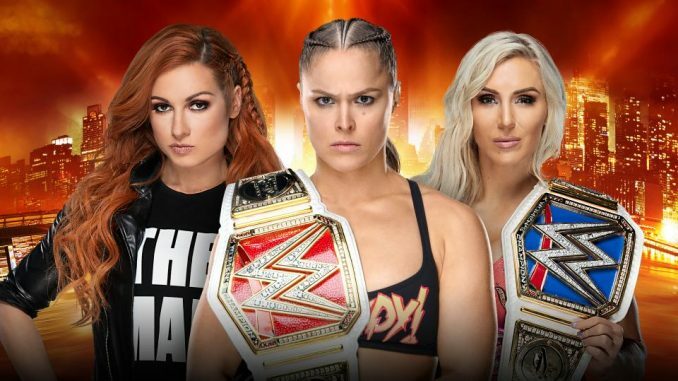 The women are the clear main event of this year’s show and I expect a 180 from last year’s reception for Brock Lesnar and Roman Reigns that ended the show on a sour note. Despite the length of the show, I expect an electric reaction for the main event and the women to go out with the idea of having the best match possible. I cannot imagine any other finish than Becky Lynch winning and holding up both titles. It is not being pushed as a unification match and most expect one title to be vacated or have them separated again in the future. Even if Rousey were agreeing to stay on for another month or so, I wouldn’t have her retain the title. Realistically, if she is going away for an extended period, this is the show to do it on and not a month from now. The ideal finish is Lynch defeating Rousey and keeping Lynch and Flair as far away for as long as possible to do that rematch down the road. There is lots of pressure on the three and I expect a spectacular match. For all the criticism the company receives for last-minute changes in direction, this was the right to call to deviate from Bryan’s original plans. They instantly responded to the groundswell of interest being Kofi Kingston and scrapped the original plans for a better one. Kingston is among the biggest stories on the show and I think they need to pull the trigger and put the title on him. Bryan didn’t have a deep list of challenges and Kingston appeared out of left field and transitioned this title program into the number two match on the show, in my opinion. I feel you could put this on late in the show and the audience will be with it. Their contract signing was a great segment and perhaps Kingston’s best promo of his career. This is the match where I expect a strong heel win from Lesnar because everyone feels like this is the one that doesn’t get the triumphant babyface to win. Lesnar feels like he’s cooled off a lot from last year and between his rare appearances and Rollins being hurt in February, this is a program that doesn’t have the dynamic of a big title match. That said, I do expect a great showing. Along with John Cena, they tore the house down in a three-way at the Royal Rumble in 2015 and this is the type of match that brings out the best in Lesnar with one of the best performers in the company. There was a ready-made program for Rollins in Drew McIntyre coming out of this show, but I’m leaning towards Lesnar retaining for the surprise finish if it’s even that surprising. It’s fair to say this program had a disappointing build up after a hot start with Batista’s attack on Ric Flair. Neither one tapped into the real emotion to make this feel special and it’s been surprising given how many years Batista has spoken about wanting this farewell program with Hunter. No one cares about the stipulation because there isn’t a prayer that Hunter is retiring, especially on a show that has a farewell match people do take seriously. This could die live if it goes more than 12-13 minutes and Hunter’s WrestleMania matches are usually long. Hopefully, this one is a tight presentation and ultimately, Hunter wins, and Batista is done. The No Holds Barred element provides them a lot of wiggle room but it’s still been five years since Batista’s last match and I’m going in with a conservative level of expectation. If this is longer than five minutes, it’s going into rough territory. This seems like the easiest layout with Angle selling briefly, making a comeback and tapping out Corbin for the big pop and an emotional goodbye as Angle waves from the stage and ends his career. I’m hesitant in believing this will be Angle’s final match, but it should be and tonight, I feel the audience will treat it as a legitimate farewell. The placement of this match will be interesting. Many assume it will go on early. Because of the stipulation and the nature of Shane’s matches, it’s probably getting more time than it needs. The Falls Count Anywhere stipulation means we are probably getting a big stunt somewhere in the stadium. I see Shane winning this one and continuing his heel run, it’s a show with a lot of potential babyface wins and this could go the other way. This should be strong providing they are not hampered by time. I would assume they will get 15-16 minutes. Orton winning sets up a challenger for Kofi Kingston and would continue AJ Styles’ losing streak. Styles seems in need of a reset with new opponents on Raw, so losing here and being drafted to Raw is conceivable. The build has been simple and effective with some strong promos using reality for digs on the other and the audience has responded well to the program. Given the Phenomenal Forearm into the RKO spot on SmackDown, they probably have an even more ambitious RKO spot in mind for tonight. This is an interesting match to book because logic dictates Reigns should not be losing this after his comeback and the audience behind him. Conversely, McIntyre has been protected so well and recently beat Rollins. It’s a good dilemma and shows the value of keeping two opposing forces strong, so when they meet, you can debate the outcome and adds instant intrigue to every spot because of the win and loss meaning something. McIntyre has been very strong on his promos and seems poised for an enormous post-Mania run on either brand. Reigns losing is not the end of the world, it’s the Japanese model of a top star returning from a long sabbatical and not being at his best with his fellow top talent. WWE does not typically run from that playbook, but it is the story with hints that Reigns isn’t 100% even though he insists he is. Beth Phoenix has been great during this quick buildup and her return may be overshadowed on such a large card but adds a lot to this match. After watching Phoenix on Raw, putting the titles on them and having Phoenix stick around for a bit seems like a strong idea to go with, ending with a big singles match on either brand. If not that option, I’d leave them on Banks and Bayley, who has done a strong job establishing the titles as the inaugural team to hold this version of them. I would have kept this a three-way with The IIconics in the battle royal as there are a lot of moving parts in this match. Mysterio is good to go after an ankle injury scare this past Monday. I look at this card and this could be the favorite to get cut on time. These two have been among the best performers on the roster with Mysterio revitalized and having some of the best matches of his career. Joe has been a solid all-around performer, and this will be his first WrestleMania match. The focus is on Dominic and the heavy insinuation that he’ll be involved in an angle. I see this feud continuing and Joe doing something heinous to Dominic either during or after the match. This is probably the start of a feud rather than a culmination. I would have preferred if The Demon version was held off as a surprise as that’s the big pop when the lights go out and fans realize it’s not the regular Balor entrance. Balor should win and do so quickly. The entrance is probably the only reason these two are receiving a singles match as it feels like we’ve seen it too many times this year. It wasn’t the most compelling lead up to this match announcement, but if given the time, it should be a strong match with the eight involved. It was surprising The Hardys didn’t get one of the slots after both The Usos and Ricochet teased something with them in segments over the past month. Ricochet and Black are 0-2 in tag title matches this week challenging for the Raw and NXT versions, so they may be due for a win here. This is another match that will live or die based on time allotment but there’s a lot of talent in this one and it should be good. It seems the only reason this match is on the card is for the local team to pull off the upset, end Hawkins’ losing streak and leave with the titles. That’s it. There are 29 names announced with the key ones being Braun Strowman, Michael Che, Colin Jost, Andrade, and Ali. The rest are background players unless there are additional names entering, like a Kevin Owens, who is not listed for the match. It would seem Ali would the one to benefit from the win, even though this is a match that means nothing to the audience or carries any legacy that the winner improves their lot. For publicity purposes, Che or Jost winning is possible, although Strowman press slamming them to the floor is the visual for the mainstream outlets. Announced: Asuka, Naomi, The Riott Squad, Mickie James, Nikki Cross, Zelina Vega, Mandy, Sonya Deville, Lana, Dana Brooke, and Carmella. I would expect a bunch of additional names from the other brands to be added to this one so the ring is full. I’m expecting Lacey Evans to enter and win it. This is on the kickoff show, which should benefit them as they will get more time on that timeslot than the main show. The Cruiserweights always deliver and these two are going to try and have the best match imaginable on this setting. Hopefully, it’s not a case of the stadium being empty as fans are filing in, which is a terrible atmosphere that performers have battled in the past. Nese is playing the underdog and I’m expecting Murphy to retain but this has the potential to be a big sleeper match.